The disaggregation concept embraces the open-source approach where WiFi solution providers can decouple their hardware choice from their software choice. This decoupling trend has already been successful in other industries such as the computer and smartphone markets. In the WiFi industry, disaggregation enables WiFi professionals to control their costs when deploying or upgrading a WiFi network and obtaining significant cost savings. At Tanaza, we fully embrace the disaggregation concept and our software allows you to choose the hardware vendor most suitable for their deployment. Our latest product, TanazaOS is a Linux-based operating system for centralized wireless network management developed based on the disaggregation concept. TanazaOS allows enterprises and service providers to reduce their CAPEX and OPEX. For example, when a WiFi solution provider using TanazaOS has to decide the type of hardware for his next WiFi deployment, he will be able to choose cheaper wireless devices such as consumer/SMB devices which cost around $100/unit, unlike someone using a vendor-lock-in solution who will have to spend around $300/unit (hardware + software solution). By using TanazaOS, a WiFi administrator enjoy the same set of professional features whatever the model of access point selected. Features include for example remote monitoring, centralised configuration, multi-site management and self-provisioning. TanazaOS self-provisioning system enables WiFi administrators to pre-configure the access points before shipping them to their customers (offline configuration). 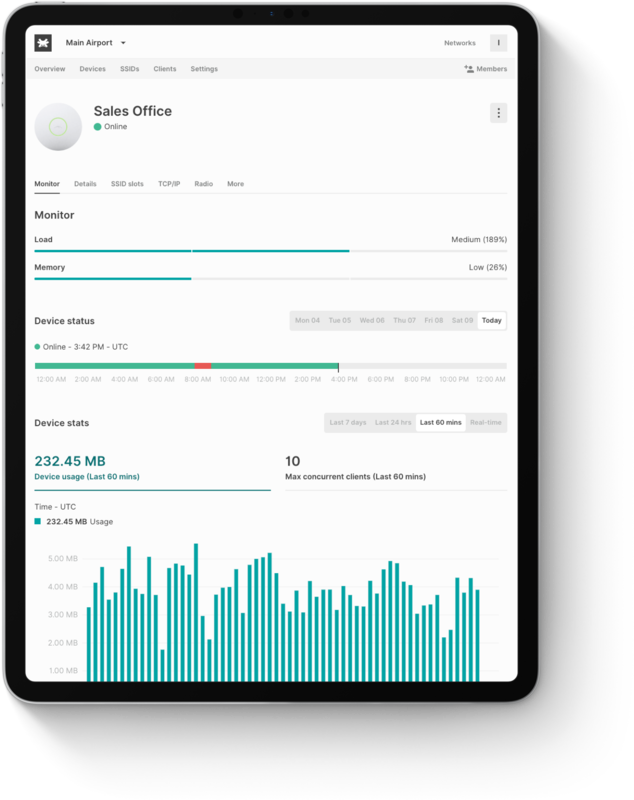 Once online, the wireless devices will automatically sync the configuration, allowing WiFi administrators to speed up the WiFi network deployment and to reduce on-site travels costs. Moreover, large WiFi network configurations are facilitated thanks to the network-wide configuration system. When managing a WiFi network, the TanazaOS’ remote management feature enables WiFi administrators to reduce maintenance and troubleshooting cost: receive email alerts in case of access point disconnections, perform manual or scheduled reboots directly from the cloud, and keep an eye on your access points status thanks to the global map. This has direct impacts on maintenance budget such as no need for technicians on site, the fast configuration from a centralised platform, firmware’ scheduled upgrade, and disconnection alerts. 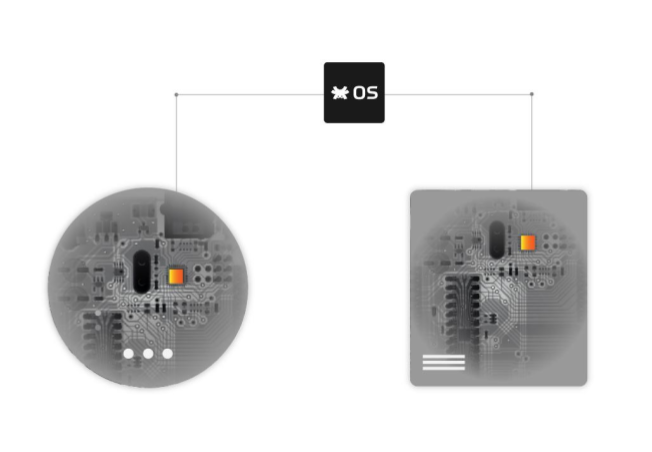 TanazaOS is conceived around the disaggregation concept, which means offering the option to select software from one vendor and run it on hardware from a different manufacturer. It is an operating system that supports WiFi solution providers who are looking for a flexible and efficient self-provisioning system that facilitates unlimitedly scalability and helps in delivering wireless networking services faster. At Tanaza, we want to deliver a complete and cutting-edge product. With this in mind, we are constantly expanding our set of features. For more information about the new TanazaOS, feel free to try the interactive demo or to contact one of our Tanaza consultants. 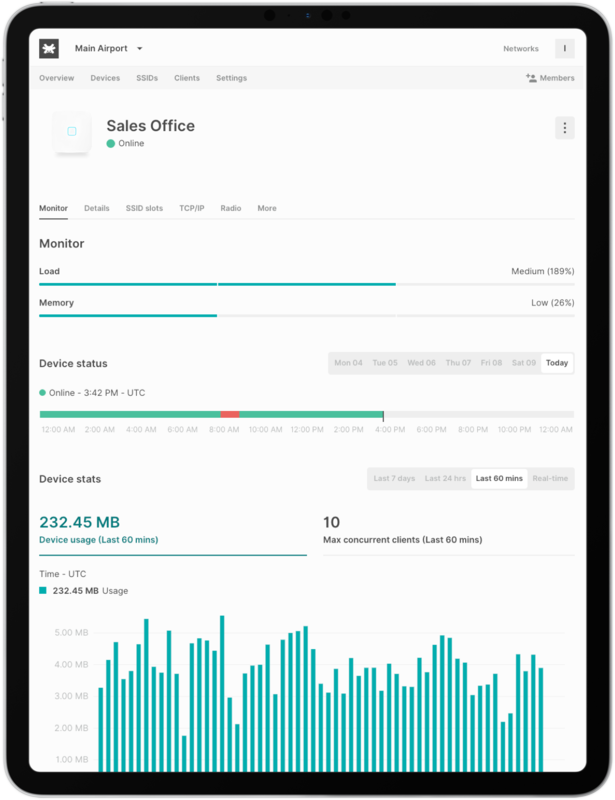 With Tanaza, WiFi network administrators can currently limit the bandwidth for their WiFi networks by controlling the bandwidth per SSID and controlling the bandwidth per client. These two features allow WiFi administrators to first, limit the overall bandwidth at the SSID level, and second, limit the bandwidth at the WiFi user level. Both features aim to allocate the same amount of bandwidth per client/SSID in order to ensure the proper functioning of the WiFi network and offer high-quality services. Furthemore, Tanaza developed the Access Point Selector to help WiFi administrator determine the total amount of bandwidth he needs to provide to his WiFi users accordingly with the level of services. Consider that calculating the right amount of bandwidth is one of the most important steps when deploying a WiFi hotspot, especially for WiFi administrators working in the hospitality sector. In the example below, the WiFi administrator limits the available bandwidth to 100 Mbps per SSID, and the bandwidth per user level to 2 Mbps. In addition, the administrator limits the number of concurrent users to 30. As a result, the bandwidth used by WiFi users is maximum 2x30 = 60 Mbps. This means that about 40 Mbps won’t be used by WiFi users. Tanaza is thinking about developing a new feature to optimize the bandwidth limit per SSID and per client. The idea is to dynamically assign a higher bandwidth value to each connected user until they reach the maximum bandwidth value configured by the WiFi administrator for that specific SSID. This way, when a new WiFi user accesses the SSID on the same access point, the bandwidth exceeding the limit configured (in the example: 2 Mbps) will be distributed again according to the new number of concurrent users. In the end, the overall SSID limit will be optimized, allowing WiFi users to enjoy a higher level of bandwidth when the number of concurrent users is low. 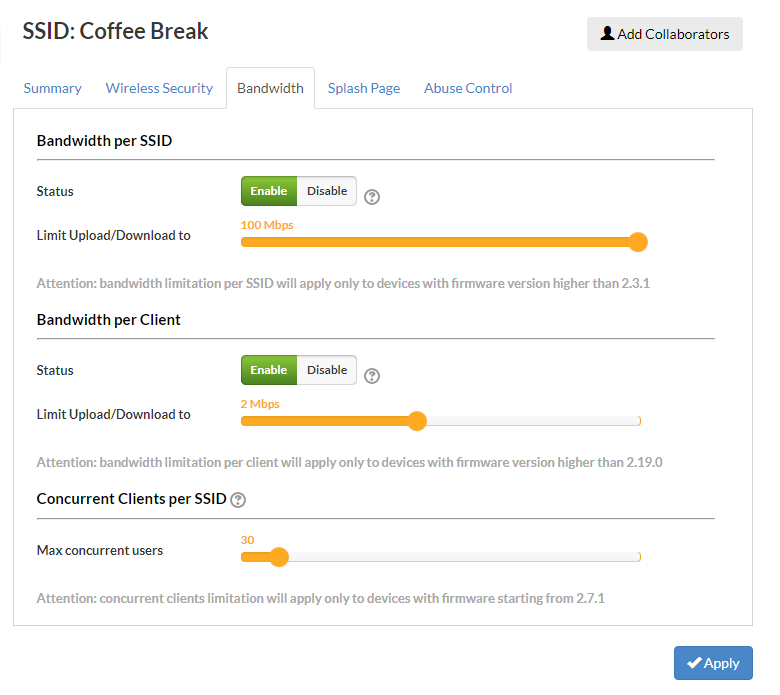 If you like the feature of the dynamic bandwidth allocation for SSID, you can upvote the idea on our Feature Lab.